Life is full of surprises. Live it to the fullest and enjoy the adventure everyday. After one hell of a 'roller-coaster ride' kinda vacation in India, we got over the jet lag in a couple of days as expected. Having had lots of people around us all the time during our vacation, you surely would understand that we are missing being around people. I have to confess that I have always been very emotional about India ever since I left in 2001 but as years are passing by that feeling has been increasingly growing. Anyways this time while in India I had my eyebrows done and once again put myself through that horrible pain. All it takes is 10 to 15 minutes, but it is most difficult to endure the pain, the tears and the non-stop sneezing. Each time I swear on my tears that I am never going to put myself through this misery again. I know all the men out there are not going to understand a bit of what I am saying, my suggestion consider yourself lucky you don't have to do one. Tell me, are you going to listen to the person who is plucking the life out of you? Seeing me in pain the lady decided to give me the same old tip "you need to do this more often, you just cannot have it done once in a while and wish its not going to hurt". I know I know lady...but how am I gonna find that time to drag myself to some 30 odd miles drive just to go through this misery every 3 weeks? Not because I enjoyed listening to my tormentor's little speech on making the eyebrow threading more regular, somehow I decided this time that I am going to make it a point to be more regular. If you think that I stuck to my decision of being more regular, you don't know me well yet. Yes the decision was forgotten as soon as the hectic life started back home. The other day I was dropping Mollu to the bus stop, when one of the fellow Mom, decided to start an unusual chat with me. She came right next to me and asked "Did you get your eyebrows done?". Huh !! I never thought that the eyebrows had made such a big impression considering the fact that my eyes are hidden behind those glasses that I wear. I was suddenly proud that I had my eyebrows done and she had definitely reminded me of the resolution that I had made in India. I told her that I had it done from India during my vacation and also gave her the short story on how I won't be able to continue doing it as the only place I know is about 30 miles drive from our place. To my surprise the eager Mom said she knows a lady who does threading and the best part, she lives near our neighborhood. She even invited me to join her in the evening to have it done together. Evenings are always hectic at home, so I decided that I'll hold on to the card of the eyebrow lady and visit her over the weekend. Fridays evenings are the most lazy evenings in my house, the evening chai session usually goes on for hours with catching up on some Indian News. Like I said we are getting more and more homesick/emotional about India. The card of the eyebrow lady was lying on the side table reminding me that it has been more than 3 weeks since I had done my last threading and its time to prove that I am determined enough to have threading done regularly. The card read Sunetra Tope, a marathi I analyzed. Our ordeal with mosquitoes continues. We are still struggling with the jet lag…but with those precious long afternoon naps (after a sumptuous home made lunch), I do confess "I am loving it". Actually there are not many mosquitoes here inside the home but due to some odd reason those present get attracted to Rhea and me. Others at home including Jee are not even a bit bothered by these godforsaken terrible pest. Back in my college days one of my best friend used to be troubled a lot by the mosquito bites. I remember she used to say its all because she has "Royal blood" and that's why mosquitoes get attracted to her. So I can also say that Me and Rhea have the "Royal blood" inside us too. Rhea, with lots of training tries real hard to keep herself from scratching the insect bite but at night she somehow scratches them and says "its real hard not to scratch". Back in Orlando we had picked a particular insect repellent spray which claims to be natural with an implied green bottle and also explicit notes on its effectiveness against a wide variety of insects. We have the leading Indian mosquito repellent "All-out" plugged in in every room, its effectiveness can be questioned as we still see and hear many stray mosquitoes in the room in good health enjoying their recon missions. Last night after 2 days of struggle with the mosquitoes, we decided to give our very green Orlando bought mosquito repellent spray a try. Result: next morning Rhea was very happy and did mention that mosquitoes didn't bite her and her old boo-boos are not that itchy any more. Its also because of her trust factor for the American spray I guess. She has this strong trust on the pink calamine lotion that we usually use as anti-itch. Magically the itch goes away as soon as I apply the pink magic potion. Anyways, after fighting another bout of scratching and itching Rhea woke up from her afternoon nap two days back saying she wants to go back to America. 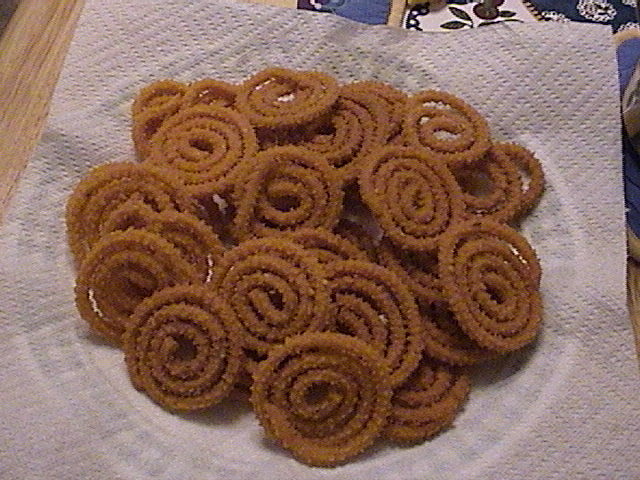 Ammachi (Jee's mom) gave her a bowl full of some home made nibbles murukku and pakavada to cheer her up. Half an hour later she was back chirping, playing happily and enjoying the evening with her cousin. 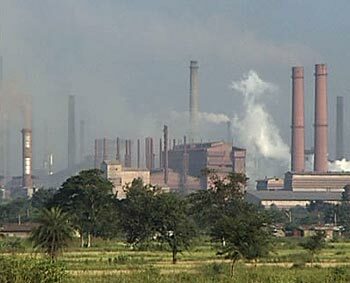 PS :- There are scary stories of chicken-guniya and dengue fever making rounds around this small town of Bhilai. Actually I guess the medical world here have started labeling any ailment now as a viral variant of this new evil epidemic. I hope these things doesn't affect our rest of the vacation. Fingers crossed.